Revisions. I always think I’m done before I really am. Just when I was trying to come up with a blog post, my friend Pamela Hunt reached out and “tagged” me for a blog tour all about the thing I was having a really hard time doing that day: writing. That’s how things have worked with Pamela from the outset. She is a generous champion of my work who has connected me with editors and agents. She has been a tireless and insightful reader. She even landed up moving right to the setting for some critical scenes in my first novel, Camp Lejeune Marine Base where she now lives, teaches yoga, mothers her sons, and writes. Before she even unpacked, she sent me photos and literary descriptions of her surroundings so I could keep working. The writing on her blog, walkingonmyhands.com, continues to inspire me with its honesty and heart-grabbing sentences that mark her unusual journey through life. Here goes, then, with my answers to four questions about my writing. The short answer: two novels, my blog, and a collection of essays and stories that exist in drafts ranging from a few lines to almost complete. I’m revising my first novel, Casualties, and doing research and early sketches for my second. The work on Casualties has pushed its way to the fore right now for some exciting reasons which I will save for another time because I don’t want to jinx anything. I’m not sure the parallel holds up all along the line but the need to build endurance and to push through mental and physical blocks resonate with me. When I started down this road, I never gave a thought to the physical blocks. Now I work out just so I can sit or stand at my keyboard. As for “gunning it” at the finish line — I have found that the finish line is where I must be my most patient, my most humble. I’m never done when I think I am. My novel, Casualties, joins the growing body of fiction that deals with the impact of our most recent wars on those who fight and those who wait at home. The protagonist, Ruth Nolan, however, is a departure. She is a mother and successful defense industry executive who depends on those wars for her livelihood. We haven’t seen a “coming-home” story from this perspective yet. When it comes to my blog and essays, any differentiation probably comes down to ears, eyes, and voice. There are no new stories under the sun, so they say. But not one of us sees or hears the world around us the same way. I try to remember that every time my inner voice screams “this has been done!” Sometimes she’s right and that pushes me to look deeper and work harder to find the unexpected. I wish I knew. I have thoughts. I have ideas. I love figuring them out on the page. Writing teaches me about myself, about the world I live in. It can start a conversation that takes me in new directions. I’m basically an introvert with a big mouth. When it comes to fiction, I am struck by a person or a dilemma that won’t leave me alone. Writing is the most fun — and the most frustration, pain, sorrow, joy — I’ve ever experienced in an individual pursuit. I am so glad I get to do it. I get anxious when I don’t. Get dressed. It’s work, damn it. I need to show up like I mean it. Also, I’ve run out of excuses for greeting the UPS guy at 3 p.m. wearing fuzzy pink slippers and my green plaid bathrobe. Plan. At the end of each month, I print out a calendar for the next month and identify all the blocks of time available for writing. I list the things I’m aiming for that month, e.g, a new chapter, revisions, essay draft, research, submissions, queries, etc. and prioritize. The month almost never turns out as planned but this exercise calms me. It lets me see how lucky I am and how much time I do have and it motivates me to use it well. It also results in, well, results. Maybe not all I had hoped for but perhaps more than what I could have accomplished if I hadn’t been intentional about the whole thing. Routine. My basic writing day goes from 9 to 3 and two days a week I have some evening time. I always have my journal up first in the morning and leave it up all day so I can pull from it ideas I had, or add to it, or scream into. I usually continue from where I left off, rather than extensively editing what I wrote the day before. I make notes about revisions I want to make and save them until I’ve completed a draft. Most of the time. Don’t be a slave to routine. This is my reminder not to freak out when the stuff of life upends the routine. Write when I can. Grab every minute. Let go gracefully when it is time to let go. I’ve tagged four wonderful women writers to continue this conversation. Next week, they’ll be sharing their writing processes. Check them out! Rae Padilla Francoeur. Author of the memoir, Free Fall, A Late-in-Life Love Affair, Rae blogs, reviews books, and runs the New Arts Collaborative, a creative marketing business that works with artists in creative and entrepreneurial ventures. She has written three novels and is at work on a second memoir. Link to her blog here. Judy Reeves. “Writer, teacher, writing practice provocateur” is the tagline on Judy’s blog. She has authored three books for writers and is at work on a new project based on workshops she has conducted, “Wild Women, Wild Voices” due out in 2015. Janice Wilberg. Janice’s essays have appeared in Newsweek, the Modern Love Column of the New York Times, The Daily Beast, Salon.com, and the anthology, “Precipice, The Literary Anthology of Write on Edge, 2012.” Find her at her award-winning blog, Red’s Wrap. Anita J. Knowles. Anita studied film at USC, blogs, and is at work on her first novel. She writes with the kind of originality and honesty you’d expect from a woman who pulls no punches and constantly challenges herself. I’m hoping she’ll share the interesting experiments she’s been doing in her own writing process lately. Link to her blog here. Betsy thank you for your generous comments. All I can say is that I have learned so much from your careful and muscular prose, your kind and spot on critiques, and from your writing life. I love this idea of planning. I have never done that. It’s genius!! 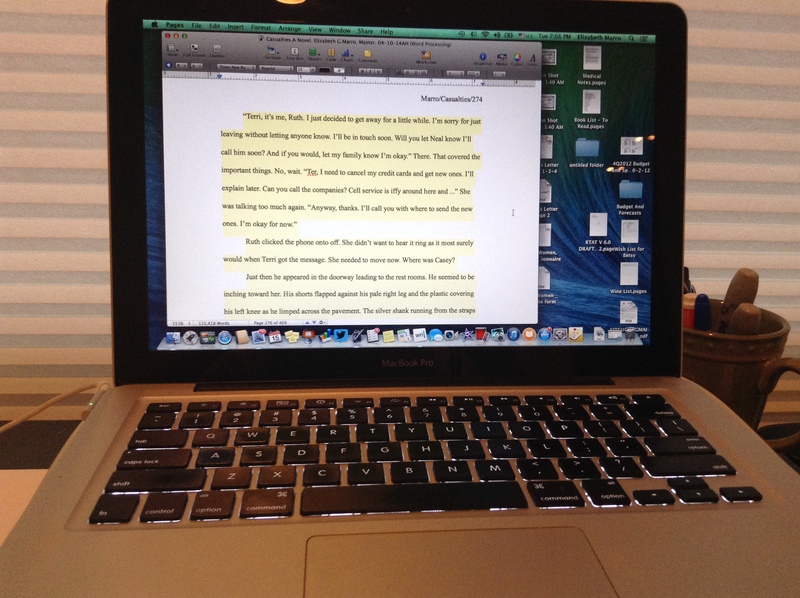 I love reading about your writing process and am excited to read the blogs you have tagged. What a great way to turn people on to different writers and their perspectives. Hi, Beth! Thank you and definitely check out these great writers! I, too, am impressed with the ‘month-at-a-glance’ approach to planning your writing month, Betsy. I’m going to do this!!! Thank you for the great idea. This is a really helpful blog. You also remind me to take essential time to help other writers who, like so many of us, are working hard and often, in isolated situations. I always enjoy reading your posts. I admire your schedule and dedication. And I look forward to some good news about Casualties. I know Jim loved it. Thanks for links, will check them out, too. Writing has been tough for me lately for a variety of reasons, but I look forward to having the summer off from teaching and being able to get back to my two novels. You’re fortunate to have a friend like Pamela. Hi, Lynette and welcome! The beautiful thing about an electronic journal which I use most of the time these days is the “find” feature. As for my hard copy notes and books, I recently went through a bunch of the ones I am using for projects and used markers or sticky notes to help me find what I was looking for. Sometimes, journaling takes the form of a few words on a napkin which i stick in a folder and then type into my electronic version. I am happy to know about the book and will check it out. Thank you!